Are you Unstoppable? Before you answer the question, I want you read. 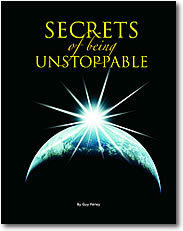 Being unstoppable is different from anything you’ve ever seen or heard of before. It has nothing to do with positive thinking, goal setting, visualization, overcoming people or events with psychological powers, or gaining an advantage at the expense of anything. It’s much better than all that. Did you know? The greatest natural resource in the world is not in the earth’s waters or minerals, nor in the forests or grasslands. It is the spirit of every unstoppable person. Pineappleope.com is here to guide your journey. Learn the simple and elegant power principles in this official PAO program, you’ll wonder how you ever lived without them. How can Pineappleope.com make such a statement? Simple. Because of feed back. -How to awaken new-found stores of life energy within you! If I am unstoppable, can I actively stop other people? Like, can I keep them from storming into my cube, stinking of the ashtrays they lick, wearing comical hats, and talking like they.. Wait.. who has this program? I need to KNOW – did you ever distribute it in Canada??? Pingback: Pineappleope.com » Blog Archive » BREAKING NEWS - PAO affects your rent! Previous PostPrevious PAOQOTD – Did you get what you wanted for Xmas?